HARTFORD - A state senator is asking that the deadline for Eversource and United Illuminating to make changes to the way their bills display third-party supplier information be moved from July 31 to March 31, 2019. The draft decision setting the deadline for July 31 came after the Public Utilities Regulatory Authority began looking into how third-party supplier information was displayed, The matter was first looked into in 2015, then more extensively this year. Utility customers can either use standard service from Eversource or United Illuminating, which comes with a generic service rate for all customers, or get electricity from a third-party supplier. The third-party option allows customers to shop around for a better price. Third-party suppliers use the delivery and billing infrastructure of Eversource and United Illuminating. Suzio became involved with the recent investigation when he discovered that his third-party rate from Spark Energy on his January bill was higher than what he was told the next month’s rate would be in December, resulting in an increase of $140 for one month. Hearings were held over the summer, at which Eversource and United Illuminating staff acknowledged inaccuracies. Third-party suppliers are not providing accurate information in a timely manner, if at all, they contended, and they explained the changes that would be needed. Those changes were estimated to cost nearly $700,000 for Eversource and $800,000 for UI, and could take up to nine months to make. The draft decision says the change costs are to be borne by the third party suppliers. 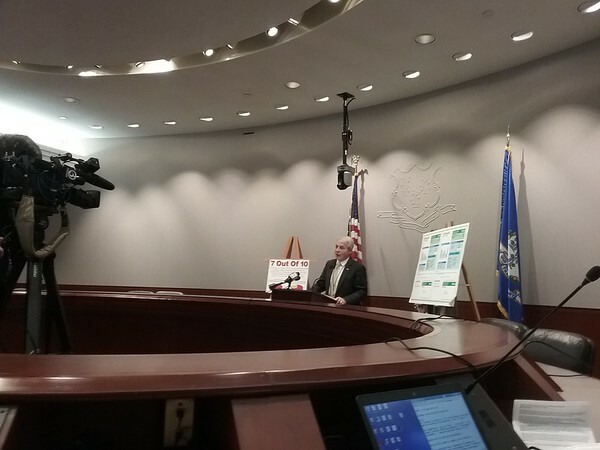 “You shouldn’t be surprised when you open an electric bill,” said Consumer Counsel Elin Swanson Katz alongside Suzio during a press conference at the Legislative Office Building. The state’s office of Consumer Counsel helps regulate utilities, and is always available for help clarify a bill, Katz said. A final decision is expected to be made within a month, after Eversource and United Illuminating submit written exceptions due next week. The oral argument deadline schedule is still being figured out. Charles Paullin can be reached at 860-801-5074 or cpaullin@centralctcommunications.com. Posted in The Bristol Press, General Business, General News on Friday, 26 October 2018 20:56. Updated: Friday, 26 October 2018 20:58.